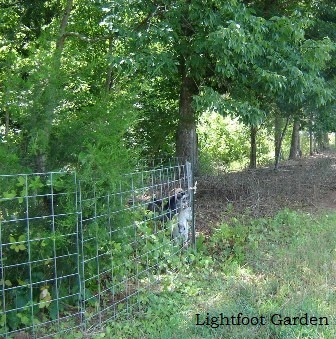 Livestock panels, sometimes known as cattle panels or hog panels, have many uses in the garden. They are 16’ long and 36”(hog)-52” high. The spacing between the heavy wires in the ones I have is 6”x8”. Some panels have closer spacing near the bottom. I first learned about them as animal fencing, but they prove quite handy to have in the garden. Although the panel itself can flex, it is a strong fencing that does not need tightening. 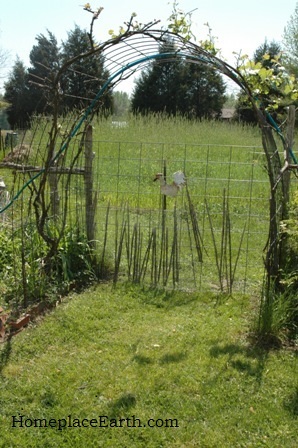 In the picture you can see my garden gate and grape arbor, both made from the panels. To bend a panel into the arbor shape, lay it on the ground and have someone hold one end or anchor it in some way. Pick up the other end and walk toward the first end. It’s that easy. We needed more height in the arbor than the 16’ panel would provide, so we put it on top of two rows of bricks on each side. Rebar is inserted into the ground through holes in the bricks. The panel is wired to the part of the rebar sticking up from the ground. You can find these panels at farm supply stores. You can find rebar at home building supply stores in the area where they display cement blocks. To see how this arbor looks when the grapes are in full production, go to my March 6, 2012 post On Growing All Your Own Food. The panels can be cut with bolt cutters or a hacksaw. I cut one to make my gate. I have wired ½” hardware cloth to the lower half of the gate to keep rabbits out. An earlier attempt at rabbit control was to weave bamboo through the spaces. If I have enough bamboo strips there, it works. However, I need to keep after it. When I came across the hardware cloth, I went with it. There is no hinge or latch here. The gate fits between the arbor and fencepost on the hinge side. On the latch side it just leans against the regular fence. We have plans for putting new posts in that garden entrance and this gate, put up several years ago, was only meant to be temporary. I also use the panels as a trellis for garden crops, particularly tomatoes. I put a fence post on each end and one in the middle. Baling twine often serves to hold it to the posts. The panel goes down the middle of my 4’ wide bed and the tomatoes, planted at the base, are just woven through the spaces as they grow. In that wide bed there is still space on the sides for carrots, basil, parsley, or just heavy mulch. Tomatoes can do without a trellis as sturdy as a livestock panel and I also use old field fencing to trellis tomatoes. The panels, however, present a neater appearance. These trellises stay in the garden all year. In the fall, when I’m planting cover crops, I move them to where they are needed the next year and set them up. I can do this because I have no need to till the beds before planting tomatoes, or whatever it is that the trellis will be supporting. I just cut the cover crop with a sickle and let it lie as mulch or remove the biomass to the compost pile. The bed is ready for the next crop with the trellis already in place. These panels are great for making structures, like small greenhouses. 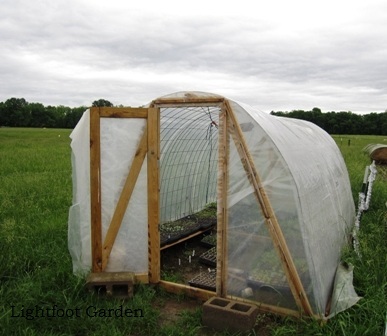 The photo shows the greenhouse our daughter Betsy made for her Arkansas garden. You can also see it in Betsy’s segment of Develop a Sustainable Vegetable Garden Plan. She built a wood frame for the base and used wood to frame a door on one end and a vent window on the other. You could use the panels against the side of a building as a lean-to structure and build something taller. Of course, you could actually use these panels for their intended purpose, controlling livestock. They make good temporary or permanent pens. Beware of using them with young goats developing horns. The goats might get their heads stuck. Once the goats and their horns grow enough, that’s not a problem. If that does happen, don’t panic. 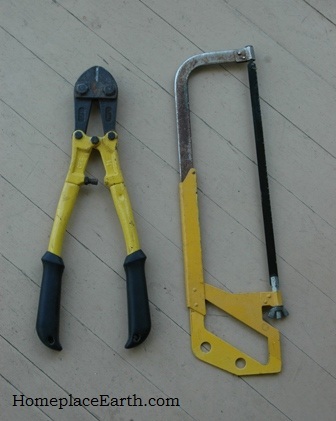 Cut the fence with bolt cutters or a hacksaw, preferably with the bolt cutters. You can mend it by using wire to close up the space. I have a leftover spool of aluminum electric fence wire that I cut and use as twistees to hold the fence to metal posts. Baling twine works, as does plastic zip-ties. The panels are good barriers for most dogs, goats, cattle, pigs, etc. Chickens, however, can slip through, as well as other small critters, such as skunks, rabbits, and opposums. You can add chicken wire or other fencing to the panels to keep out the smaller creatures. Betsy and her husband, Chris, are using livestock panels as movable fencing with their goats to clear a future fenceline. They gradually move the pens down an overgrown area on the side of a field. Sometimes the panels are tied to trees and they are flexible enough to curve around obstacles, if necessary. Betsy and Chris use as few posts as they can get away with, since they have to move them regularly. The ends are put together with clips, similar to carabiners. Besides just connecting the ends, the clips can act as hinges, or as latches if that’s where they decide they need a gate to be. You can see the great job the goats are doing clearing the brush by the trees. Goats love eating brush better than grass. This is a great use of both the goats and the fence panels. Getting these 16’ fence panels home from your farm supply store might pose a problem. I’ve used a pick-up truck with an 8’ bed, putting one end inside the tailgate, extending the panel over the truck cab, and tying the other end to the front bumper. I wasn’t going far. If you do that, protect the top of the truck with a piece of cardboard or old blanket. If you buy enough, you could have them delivered. If you are going to cut them into shorter lengths anyway, you could do it right there and make getting them home easier. Some of you reading this may have already been using these fence panels on your homesteads and have plenty of ideas and uses of your own. If you would like to share them, I welcome your comments. If you are using these panels for the first time, good luck, have a good time, and let us know how it goes. I hung one in front of a window on hooks screwed in to the soffit of my roof and let luffa gourds grow up it. The plants a great summer sun screen and produced lots of little edible fruit and a few big sponges. At the end of the season, I took down the panel to let the winter sun shine in. I left the hooks in place (they are the plastic coated kind you could hang a bike from). I am planning on haning the panel back up and growing pole beans on it this year. I hope to take down the panel and harvest the dry beans at the end of summer. I’ve got some sugar snap peas growing on one right now, too. We got them home in the back of a pickup much like you did…over the cab. It wasn’t fun but it worked. I’ve heard that they will stand on their side and curve enough to fit in a truck bed (without bending and creasing) but I haven’t tried this. Vicky, great idea! Thanks for sharing that. What an easy way to shade the side of your house. We have used them for shade in our smaller treeless pasture to make shade for our miniature sheep and goats. We arched them as you did for your arbor and then covered it with a heave tarp. We arched the sides high enough that the pygmy goats could not jump on top of it. We also use them for fencing and about everything else. We always try to keep some on hand for an emergency. Thanks Debbie. Shade in the pasture–great idea!